Children all across America thrive in the summer time. It is a three-month break from classes, teachers, cafeterias, but not reading. Year after year American students save their assigned reading till the very last minute and proceed to exchange essays and SparkNote links before the first day of school, resulting in a large pile of essays featuring unoriginal content, and a classroom full of clueless students. Needless to say when I graduated high school I relished in the idea of spending summers reading on my own time. Finishing books at my own pace, leaving the nuance of rushed reading behind me. I spent my spring reading many assigned books for various classes, from Franz Kafka to John Ashbery. This was not a bad thing. I love reading and adding authors to my repertoire is a joy. Nevertheless, I counted down the days until summer so I could attack the lengthy list of books I had been logging all semester. I planned on using and abusing my public library card. I desperately failed at finding a job, and by the end of June, I decided I was going to give up looking all together. I told myself I would spend the remainder of my summer relaxing, combing through my reading list, and of course writing. I figured that this might be my last summer to take full advantage of this kind of jobless-limbo. But I was sadly mistaken. It took me the entire summer break to finish one novel. So I asked myself: What kind of writer takes several months to finish one book? I picked up Meg Wolitzer’s The Interestings curbside in Manhattan’s East Village. Why New Yorkers dispose of $30 novels in perfect condition, nonetheless, is beyond me, however, I was operating on a very tight budget and was just happy to have a new book (free of charge) to add to my list. Approximately 500 pages in length, the novel is something akin to a brick; square, thick and with a red hardcover to boot. That being said, I had many beach days planned ahead, and I was looking forward to getting lost in Wolizter’s fiction. What would become the biggest shock was the fact that I would finish The Interestings nearly ninety days later, when I was back at school. I didn’t close the book with my feet in nuzzled in sand as I assumed I would. I finished it on a bench, wearing socks and reaching for a sweatshirt. Ninety days spent on one novel was a new record for me. Though I spent hours nursing it like a newborn, I write this post with great enthusiasm and retrospective appreciation for my time spent with Wolitzer’s story. When you are a writer (even at the undergraduate level) you operate in a world of expectation. You expect great work from yourself. Your professors expect deadlines to be met, and your peers are schlepping just as much as you are, so you’re expected to stress alongside them. Lastly, and this is never explicitly stated, you are expect to be reading outside the class requirements. So when I failed to read more than one book this summer, one of my fears was being asked, “What did you read this summer?” My answer of one felt laughable. I felt I had failed the unspoken rule of writers: always read. Naturally, reading is integral to writing. If you are not reading, you are stunting your growth as a writer. You flex your linguistic muscles equally as hard when reading John Berryman as you do when trying to write with John Berryman in mind. In an interview with the Paris Review, Fran Leibowitz says, “It’s very physical to not write — I mean, if you’re supposed to be writing.” When you are a writer who isn’t writing, some phantom entity is constantly pining you to write. When you are writing, this same voice is usually telling you what you have produced is not good enough. It’s a lose-lose scenario, but it’s an expected part of the process. When you are not writing, your thoughts are being piled up into stacks of failed articulation that render you immobile on account of idea overload. Not writing is like letting your trash pile high. Not reading is forgetting to add a garbage bag under the pile. I may have taken an entire summer to read one novel, but I feel I am better for it. 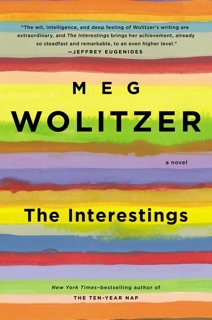 The Interestings was the first novel written in multiple points of view that I was able to fully grasp, and finish. I acquaint this to my incredibly slow reading. I spent many hours with each character. I learned their interpersonal relationships. I read their family histories and resonated with their experiences of laughter and isolation. I realize now that long gone are the days of cramming in an entire book the week before school starts, or before next class. With The Interestings, I acknowledged that I was lucky enough to spend each day with this group of characters this existed only within the book’s pages. Had it not have been for this summer spent with The Interestings, I don’t know when I would have learned the value of slow reading. It seemed unproductive and embarrassing when it was happening, but when it came time to finally close The Interestings, I was overwhelmed with gratitude and satisfaction that usually comes with finishing an amazing book. I knew after turning the last page that I would be a better writer after it. How, I just don’t know yet, but that’s the joy of it –not knowing what kind of writer I’ll be after spending months with one book.